Will it be a Wembley final for Scunthorpe FC? HFBS are Matchball sponsors for Saturday’s huge clash and local derby with Rotherham United FC in the 1st leg of the League One Play-Off Semi-finals. 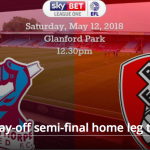 Excitement is building at HFBS HQ for the Scunthorpe game and we’re very much hoping to see them make the play-off final at Wembley Stadium on Sunday May 27th and reach the ultimate goal of securing their place in the Championship. “Up The Iron” you can do it.